Guinea fowl may not be a household name in the US, but in countries like France and Italy it is the bird of choice, the Sunday bird. Guinea fowl, also known as pintade, faraona or African pheasant used to be a wild bird; it is now mostly farm-raised. 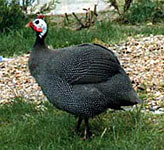 With striking white spots on its gray feathers, a mature Guinea fowl will be similar in size to a pheasant, slightly smaller than a chicken. We raise our Guinea fowls with the same care as we do our ducks. They all come from the highest grade French breeding stock to ensure a consistently top quality bird. We don't use steroids, antibiotics or growth hormones. Feed is carefully selected to meet the specific requirements of this breed. Guinea fowl meat is white like chicken but its taste is more reminiscent of pheasant, without excessive gamey flavor. They offer exceptionally high yields -a 50/50 ratio between meat and carcass: these are moist and meaty birds! They are also substantially leaner than chicken (see our nutritional information for details). Chefs and home cooks seek them out because of their marvelous flavor; in restaurants, they are often chosen over pheasants because they have fewer tendons in the leg and thigh, making this part of the bird more versatile and cost effective. 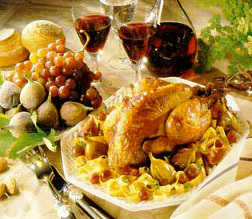 Nothing could be simpler than preparing a Guinea fowl: just substitute Guinea fowl for chicken in your favorite recipes! Of course, European cooks and American chefs have developed many delicious recipes that really showcase the wonderful flavor of the bird. Check them out in our recipe section. We offer whole Guinea fowls, vacuum-sealed for freshness. Like our other raw products, they should be used within a week, or may be frozen. Find out where to purchase Grimaud Farms Guinea Fowl.